This tour begins with everything encompassed by the 1 ½ tour and then continues around the entire island. Your journey to the southern tip of Beaver Island will take you through its beautiful dunes and forests and alongside several of the island’s pristine inland lakes, bays and beaches. 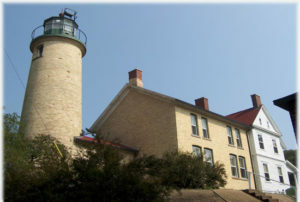 Ultimately, the tour will pause first at Iron Ore Bay for time to Beachcomb and finally visit and climb one of the oldest lighthouses on the Great Lakes, Beaver Head Lighthouse.